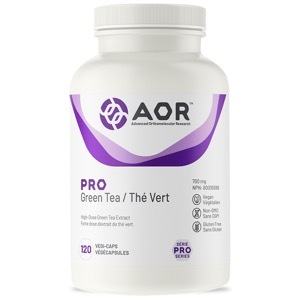 AOR's Pro Green Tea extract is standardized for 1500 mg of EGCg content to match human clinical studies, and contains a small amount of caffeine to unleash the synergy with EGCg. EGCg in green tea has been shown to promote normal cell growth and development, which is particularly beneficial in cases of aberrant cell growth. The extract also is an excellent antioxidant, protecting cells from free radical damage, while also having anti-inflammatory, and anti-aging effects. It is also useful in detoxification protocols, and supporting weight loss. Pro Green Tea has the highest standardization for EGCg, and contains 30 more capsules than AOR Active Green Tea to support long-term antioxidant supplement regimens. Just three capsules of AOR Pro Green Tea equals up to 10 cups of sencha green tea. Adult Dosage: To equate the EGCg consumption of the best Japanese studies, take 1 capsule three times daily with food. Caution: Caution prior to use in individuals that have a liver disorder or develop symptoms of liver trouble, or for use beyond 3 months.